The Kappa Alpha Theta Sorority Charm Necklace may be dainty, but it will be your favorite piece of sorority jewelry! Simple yet holds so many great memories! Greek letters are stamped on oval charm and you choose the initial. Made of sterling silver and the pearl is freshwater. The Kappa Alpha Theta Sorority Charm Necklace may be dainty, but it could not hold bigger meaning. 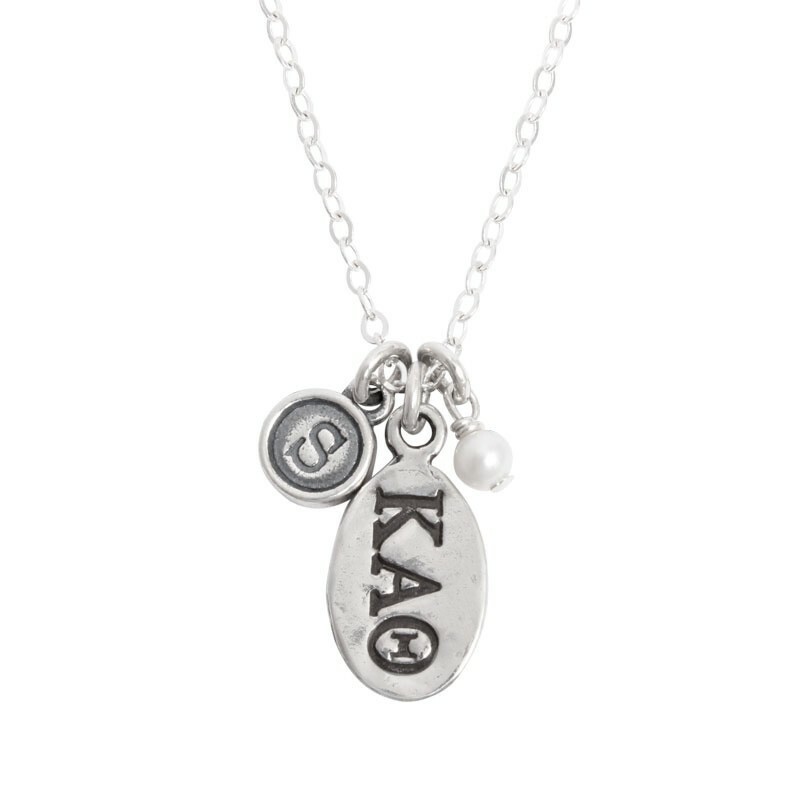 This personalized piece of sorority jewelry has the Theta Greek letters stamped in a sterling silver charm and hung next to a tiny pearl ~ an important symbol for any Theta. The piece is further customized by adding an initial charm to represent the lucky Theta wearing this special necklace! All silver is sterling and the pearl is freshwater. The Kappa Alpha Theta sorority stamped charm is approx. .3" x .5" and the small initial charm is approx. .25" x .25". The sorority necklace comes in 16" and 18" lengths. Our signature lavender and rosebud gift packaging is available.